My working model of a Bascule Bridge making its 1st public appearance at this show. After a two-year absence, my schedule was open in 2018 for me to display my trains at the annual Spring model train show held by the Fairfax Station Railroad Museum. I was especially pleased to debut my largest MOC to date: a working model of a Bascule Bridge! I also had completed my new warehouse, as well as a low trestle scene and a tunnel built of modular sections. The show was fairly quiet, which afforded me many opportunities to photograph and videotape my trains throughout the weekend. My third and last show of my summer 2017 season was at my familiar stomping grounds, the Fairfax Station Railroad Museum. For the past several years when I've shared the space with the Potomac Module Crew, I've been up against an interior wall to the left of the entrance. However, the PMC member who designs their display layouts noted that I was inside to the RIGHT of the door during the annual Holiday Train Show in 2016, and suggested we try me in that same spot for the Labor Day show with them. This gave me a slight increase in square footage, although a bit less access around the layout. I picked a similar track layout to my Greenberg show; two display loops with a passing siding for each to change out consists while a train runs by on the main track. This show would be my final use of the causeway I built for BrickFair 2017. I built some extra rock faces to smooth over the transitions between the lower table and the raised table, as well as some beach scenes to widen the causeway, which was previously used for a table that was only 3 baseplates wide. I had just enough space to squeeze in a couple of buildings for the town, although I am looking at improving all of my buildings over the course of the next year. Enjoy the pictures, and thanks for reading! Overall view of my layout at the Greenberg train show in Chantilly, August of 2017. This was before I attached the table skirt to the lower table, and added the stub-end sidings in the large empty space toward the center of the photo. After a nearly 10 year absence, I'm glad to say I finally made my return to displaying at Greenberg train shows! Fitting in wasn't entirely easy; the show has moved to the North Hall at the Dulles Expo Center (yes, the same place that hosted BrickFair three weekends prior) which is considerably smaller than the South Hall. As such, the larger model train clubs in the area must take turns at each show; only about 3 large layouts can fit at a time, and the rest of the space is crammed with vendors. In spite of this, the show organizers managed to squeeze me in on the end of a row of vendors along the wall. I offered them several different layout display sizes measured by the number of folding tables they would require, and 5x16 was selected. This gave me an ample mainline run, only having to sacrifice access along one side of the layout, as that side would be up against a wall. I settled on a VERY simple layout design: two mainlines with one passing siding each, no funny curves, no crossovers, and I only added a pair of stub-end sidings once I was at the show and realized that I had some empty space to fill. The two stub-end sidings in the upper left were added while I was at the show and realized I could use a bit more on-track storage space while I was moving trains on and off the layout. I was seated at far left, the top end was the side of the layout against the wall. Load-in wasn't as smooth as I would have liked, and that was entirely my fault; Friday evening, I forgot my crate of wooden blocks to raise the tables with. Saturday morning, 30 minutes before the show began, I realized I didn't have my box of cables to connect the 9 Volt speed regulators to the tracks. Thankfully, events work runs in the family, and my mother completely understood the struggle of needing important things at the last minute, and both times drove over an hour round trip to bring me the boxes I needed. Thanks Mom! Once I had my layout assembled, the show itself went VERY smoothly. I had a long enough mainline to run good-sized trains, on the outside loop I could reach the switch at the far right end of the layout (of course, I had to walk all the way around to get there, but still) which made changing trains a bit easier, the only major snag was that the curved bridges I built at the last minute were too narrow to handle some of my rolling stock. Ah well, hindsight is 20/20! Please enjoy the pictures and video, and as always, thanks for reading! The theme for this year's BrickFair was "X" or "10," for the 10th anniversary of the event. Fittingly, I built a 10-axle flatcar carrying a large "X" in the BrickFair color scheme, shown here with my BrickFair VA sign. After my first experience with BrickFair over a five-day period, I must admit I am kicking myself, repeatedly and hard. For over half my life, this annual festival of Lego enthusiasts has taken place not 30 minutes from my house, and yet I had never bothered to attend, much less exhibit. Finally, that has changed! Early in 2017, I made the decision to start participating in shows beyond the Fairfax Station Railroad Museum, which has been the only location to host public displays of my Lego trains since 2010. While checking the Dulles Expo Center calendar for the Greenberg Toy & Train Show dates, an event lined up for earlier in the month of August caught my eye. Scheduled for a total of five days, BrickFair not only hosted public hours on the weekend, but included two full days (plus an extra day for load-in) of private hours for AFOLs (Adult Fans of Lego) to socialize, shop, play games, share the MOCs they've built (Lego fan slang for My Own Creation, that is a custom build without official instructions) and generally enjoy the world of Danish building toys. I fired an email off to the show's organizer inquiring about space for larger train layouts, and received a very friendly response encouraging me to register my trains! So began several months of planning, building and otherwise preparing a display layout larger than any public layout I've ever done. This layout required four 30x96" tables provided by the venue, as well as two 30x60" tables borrowed from friends. I spent a Saturday afternoon cutting some wood two-by-fours down into half-foot chunks to prop up all tables except one, giving me a low table for a sectional build of rockwork and rolling green hills. I built a truss bridge again so I could have a duckunder between tables, a highway overpass to serve as a scene divider, and I used up every available train wheelset I had to fill out my equipment roster. Even after loading in, I was still finishing display pieces at home before the public show hours began Saturday! On Wednesday afternoon, I arrived and checked-in at the front desk, receiving my Lego name badge, a goodie bag, and directions to my floor space. Unloading the truck took several trips, after which I set to work assembling my layout. Because my display was positioned near the public entrance, I opted to construct a BrickFair VA sign to welcome visitors, which was one of the first display pieces to hit the table after the track was laid. Amazingly, my sectional scenery survived the journey from home intact, and most of my other structures only needed minor repairs before they were fit for presentation. By the time the opening ceremonies began at 6pm, I had been running trains for an hour, and already received many compliments from fellow AFOLs! Friday was my birthday, and what better way to spend my time than running trains all day! Well, I did break to get hot wings for lunch, and I attended a seminar called "Are You a LEGO Hoarder?" which became more of a support-group style discussion, in which we all earned custom bricks for our name badges by contributing stories about how we are, in fact, brick hoarders. Some of my favorite contributions include "If children are coming to my house that I don't trust around the Lego, I need two weeks advance notice to gather all the displays from around the house and hide them somewhere safe." "I have sets I haven't opened after buying them 25 years ago." "It's not hoarding as long as you aren't storing Lego in the kitchen or bathroom!" and my contribution "I found a box of bricks in my house and I have no idea where it came from." You may have noticed in the pictures that there are stanchions around my layout. Due to the immense crowds (over 10,000 public visitors in two days, not to mentions the 1,000+ registered participants) the crowd-control barriers are a MUST at BrickFair... and what a dream they are! For the first time in my show career, I didn't have to say to EVERY child, EVERY minute "Don't touch! No touching, please!" The barriers did all that work for me. I also didn't have to excuse myself past a dozen dumbfounded members of the public every time a train derailed, I could simply walk around the layout unobstructed. My next three shows definitely won't have stanchions, but golly, I need to make that a permanent part of my public displays. I also purchased some black table skirts for this show, as most other display tables had enormous white tablecloths draped over them, which hid their transport boxes and personal belongings, giving the show a tidy appearance. This even prompted me to dedicate some of my plastic tote boxes to tablecloths, skirts, and accessories for those two things, something I will cover in a wrap-up blog post after my next two shows. By Sunday, I was dead tired, as observed by a few friends who came to visit BrickFair. The five days of fun was fulfilling and rewarding (and I certainly collected a modest amount of swag, as shown in the picture below), but I was definitely ready to go home. Packing the layout went smoothly, and for the first time in my show career, I had empty boxes leftover at the end of packing! Typically, I bring an extra empty box in case I don't pack my things the same way I brought them, but this time I had box space leftover. How bizzare! At the closing ceremonies, congratulations and thank-yous went all around. The Slade Child Foundation thanked us for helping to raise nearly 15,000 dollars (enough to feed, clothe and shelter 450 needy children for a year), we all expressed our gratitude to the event organizers, and the event organizers reminded us that WE made BrickFair possible by entering our MOCs for display. That being said, I choose to close out this blog with pictures of many creations entered by my fellow AFOLs. Already looking forward to seeing what we all come up with for next year! Oh, and a disclaimer: I made a rookie mistake when photographing the MOCs of others, and failed to take down the name of the builders, so many of these pictures are without credit. If you know who is responsible for a given MOC, please don't hesitate to email me and let me know! I'll be doing research on my end as well, but I might not get them all. My display at the FSRM Annual Holiday Train Show was a bit of a surprise, as I was moved inside to the main building at the last minute. Typically I am 'outside' in the caboose with roughly 3x8 feet of space to work with, but unfortunately the folks who run the standard gauge tinplate trains fell ill just before the show, meaning that their layout space just inside the door to the museum became available. My only problem was that I didn't have much built to fill the space, but I think I still filled out the few tables rather nicely. The museum provided a large Christmas tree which I put at the far end of the layout, the middle was occupied by my small Christmas tree with a figure-eight loop encircling both. Then two loops ran around the edges of the tables through a small yard, and a small town consisting of a train station, fire station, tree sale lot, warehouse and bridge over the tracks. I got many compliments on the layout, and I was quite pleased I had successfully pulled off a last-minute space change; one of the advantages of using loose track as opposed to pre-built modules with track nailed down is that my setup is extremely flexible! Please enjoy the pictures and video, and thanks for reading! 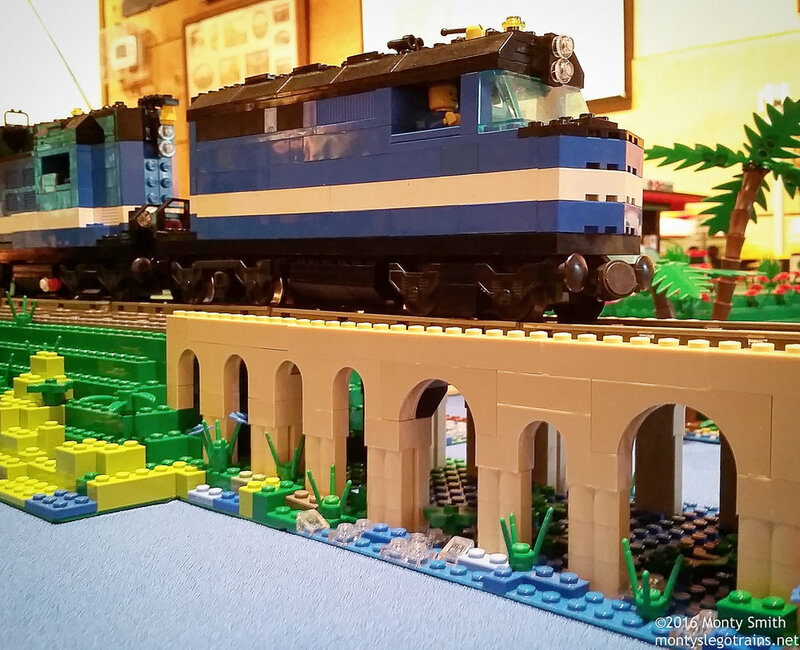 An F40PH leads a passenger train over an arched bridge on my Lego train layout at the FSRM Labor Day train show. During the first weekend of December 2015, I participated, as I have done for 14 years, in the annual holiday model train show at the Fairfax Station Railroad Museum. This is the smallest setup I do every year, using a couple of plywood slabs over a single folding table to squeeze two independent track loops into a ~3x8 foot space. This year I opted to keep things simple, and didn't use a single switch on the entire layout, while normally I include crossovers and sidings. Instead, I relied on some serious scenery for the "wow" factor. I spent a month before the show building a tunnel scene for the far end of the layout, complete with a grade that crested at the visible portal of the tunnel. Building the tunnel took up a huge amount of resources, so the opposite end of the layout was just a bit bare, with only a road crossing and small station to occupy the space. Snow mats and a lit Christmas tree with Lego ornaments and presents rounded out the display.